Unknown quantity of Dales Pale Ale + 1 six of Stoudts American Pale Ale consumed before and during the ride. Large quantity of other beers consumed post ride. Was it 6 or 7 flats? I lost count after a while but a lot seemed due to pure random bad luck. A 2 inch nail, a massive high speed blow out, a slow leak from undetermined causes and a few pinch flats from gnarly terrain. Hardly any rider escaped from this evil curse. This slowed the overall pace of the Adventure Ride. down, but other than that it was a fine day to spend in the saddle. Started off chilly, I was under dressed for sure, but once the clouds broke free and the sun gave way we had a warm day that was hard to beat. The weather "experts" sure botched the forecast as they called for rain in the morning and cloudy skies all day. Score one for us. 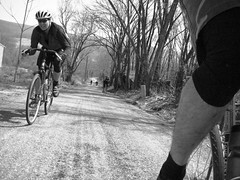 Lots of skinny tires dicing it up on the dirt roads and pavement. Started the day with some Dale's Pale Ale and eleven riders with 7 embracing the truest spirit of the ride by rolling the fixed gear. 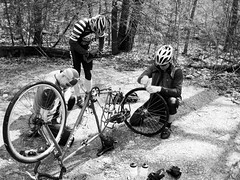 With so many stops for punctures early on the Dale's jersey pocket reserves were quickly consumed. Down to 9 riders before 10 miles clicked off, then down to a half dozen around mile 20 or so. The final six-pack of riders got some of the best stretches of riding, not that the earlier stuff was anything sub par (far from it), and also got some of the best(?) hills. When it was all done we had 48 miles in the bank, quite a few beers in the gut and some nicely worked leg muscles.